Our chalet is situated in an amazing SW facing position perched above the charming bustling village St Jean de Sixt. 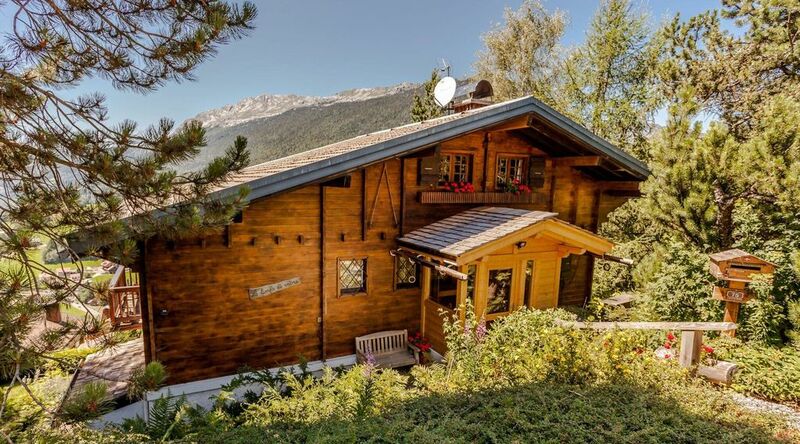 It is a very comfortable cosy chalet with large windows leading onto a big balcony & terrace. This wonderful outdoor space offers the opportunity to drink & dine till late watching the sun setting behind the mountains. There are 4 good bedrooms & a small seperate childs room under the eaves. There is a bathroom on each floor & the appartment which can be seperated has a modern kitchen & another comfortable living room. There is a good laundry room for ski boots & a garage storing garden furniture, BBQ & table tennis. The chalet is set in a safe cul de sac with good parking & an attractive garden. La Clusaz & Le Grand Bornand offer excellent skiing by car are 5 minutes away & St Jean de Sixt has its own nursery slopes! In the Summer the beautiful villages host many great activities & have superb swimming pools. Charming Annecy is very close for all watersports. Outside: Gardens, patios, barbecues, outdoor furniture b Utility Room: Washing machine, tumble drier, iron, ironing board Cleaning / Towels / Linen / Maid service: Linen and Towels optional , charged at cost for laundry. Cleaning at end of stay included. Other: South west facing balcony with large hardwood table and chairs for 8. Garage as ski and boot store, table tennis and bike store. Great time with friends and family at Chalet Le Temps de Vivre ! We had an incredible stay at this chalet in St Jean de Sixt. Perfectly located just a couple minutes away from La Clusaz et Le Grand Bornand, it's easy to get to the slopes. The chalet itself is extremely well furnished and taken care of. A special Thank You to Gemma, our host, who was always available, very nice and super helpful ! I definitely recommend this place for anyone who's looking for a chalet in the Alps ! It was a pleasure to welcome you to our chalet and so glad you had such a special time. We stayed one week at chalet "Temps de Vivre". It's a very pretty and cosy chalet, which we found everything we need (listing description and more). There is a nice and beautiful view, big balcon and terrasse. It's very quiet. With cars, It's only five minutes to go at Clusaz or Grand Bonand station. We really liked it. I recommend you! We are just so thrilled you enjoyed our lovely chalet & hope you may return one day. Thank you for being such charming guests ! The chalet is in an excellent location, not too touristy, but with plenty of shops nearby (we frequented one of the two bakeries daily). The views down the valley were stunning from the balcony, great for a glass of fizz on Christmas day. There were 8 of us staying for a family Christmas and the chalet really fitted the bill. Plenty of room for us all around the table. The wood burning stove was lovely too in the cold evenings and the chalet had all the facilities we needed. Gemma was extremely helpful and had great suggestions for walks, which had some stunning views (one over Lake Annecy). You do need a car to get about but it was relative easy from Geneva airport. Very convenient for the extensive ski areas of La Clusaz and le Grande Bornand . A car is essential, but access from Geneva is easy . A great , homely chalet with all conveniences and wonderful views. Although great for skiing season, the surrounding area must also be great for Summer walking or cycling. We've had a very happy time there and will book it again. We are thrilled when guests love our chalet& please book again in any season ! Just returned from a lovely week's ski holiday at Chalet Le Temps de Vivre. The Chalet was perfect for our group of 6 people (although plenty of space for more). Magnificent views from the windows, clean, spacious and had everything we needed for our ski week. 5 - 10 minutes drive to the ski slopes at either La Clusaz or Le Grand Bornand this chalet offered us a home away from home. A car is a must as it is too far from the village to walk. The owners were extremely helpful and a pleasure to deal with. Bonne situation entre deux sites de skis ,la cluzas et le grand bornand, chalet bien équipé et conviviale. Geneva is 1 hour, Calais is 500 miles or 8 hours. Booking Notes: Book direct with owner, 25% deposit balance 8 weeks before. Security deposit of £200 Changeover Day: Normal changeover day is Saturday.